As reported in mainstream media outlet USA Today, opposition to LNG pipelines is causing the natural gas pipeline industry headaches. Industry executives say they need additional laws to allow them to gouge pipelines across our water and property so that they may export their gas to other countries solely profiting their industry. 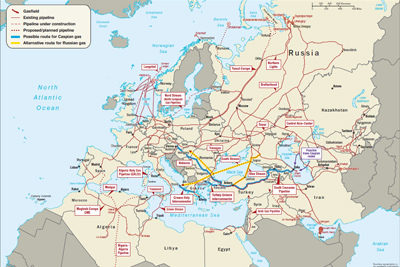 There is no public necessity and/or need for these pipelines. 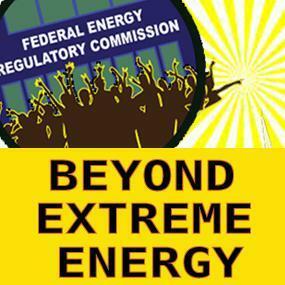 FERC can’t face the heat! But the rubberstamp machine can’t hide, either. It’s a safe bet protesters will be there at the new date. ATTENTION FERC WORLD — MAY MEETING MOVED UP TO AVOID PROTESTS: FERC has moved up its monthly May meeting at the recommendation of federal law enforcement in order to avoid planned large-scale protests. The commissioner’s regularly scheduled monthly public meeting had been slated to take place on May 21, but because of plans for protest actions involving potentially hundreds of people, FERC has moved up the meeting to next Thursday, May 14. The decision was made after a recommendation from the Federal Protective Service “to better ensure the safety of its staff and the public during the protests planned for May 21 at FERC headquarters,” FERC spokesman Craig Cano wrote in an email. Protesting begins at 5:00 pm and the meeting will start at 5:30, Tuesday 11 February 2014. Residents can speak out during the “citizens wishing to be heard” section. Sign up on the facebook event or come as you are. Lowndes County Board of Commissioners 327 N. Ashley St – Commission Chambers, 2nd Floor Administration Building Valdosta, GA. Here’s the agenda. 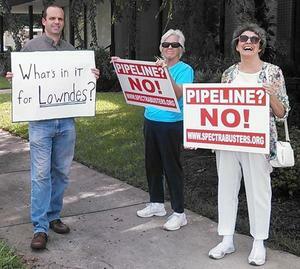 And what has the county attorney been discussing about the Sabal Trail pipeline? Valdosta, December 13, 2013 –Landowners and others can talk directly to the federal oversight agency that has to approve any new pipelines will be at an Open House they required Sabal Trail Transmission to hold Clyattville Elementary Monday evening. For those who are unable to stand and circulate the room an area will be provided and representatives from the Federal Energy Regulatory Commission (FERC) have been assigned just for this area. Protesters against the pipeline will be out front starting at 4PM. Why: Spectra Energy proposes a hundred-foot-wide gash through our lands for their huge 36 inch Sabal Trail gas pipeline from Alabama through Georgia to feed Florida Power and Light (FPL) for no benefit to local citizens. A one-time payment is nowhere near adequate for permanent destruction and hazards when FPL and Spectra would profit forever.